30 inch Mountable Charge and Sync Power Strip Overview: The CableMAX CM-USBCS-SM is a Fully Mountable 30 inch USB Power Strip and is enclosed with an industrial-grade extruded aluminum case. 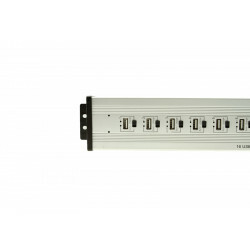 Uses 16 USB Ports to Charge or Synchronize with 5V 2.4A per USB port. Heavy Duty aluminum case design for exceptional heat distribution. Power and USB cable receptacles conveinently located on the end of the Power Strip. Syncs information using the USB Type-B port on the power strip to your host computer Type-A port. Ready to be used once the power cable is connected, no on/off necessary. 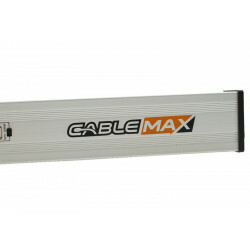 The CableMAX CM-USBCS-SM is a Fully Mountable 30 inch USB Power Strip and is enclosed with an industrial-grade extruded aluminum case that serves as a housing for 16 USB charge and sync ports for devices such as iPads, Tablets, Mobile Phones and more. The USB Charge Sync power strip incorporates mounting brackets on both ends that allows it user to place it in a work area, under tables, or on the wall in vertical or horizontal positions to provide easy, out of the way access for USB charging devices. 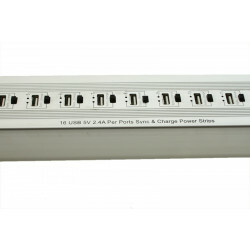 The CM-USBCS-SM heavy duty construction of the 16-Port USB charge sync power strip is designed with a straight on, no hassle access for easy organization of connected devices for charging or synchronization of multiple USB devices. Each port incorporates a "Charge/Sync" switch to designate that ports function, synchronization is processed through the USB Type-B port to your host computer's Type-A port. When in charge mode a green LED illuminates to indicate the switch is in the charge position, a red LED illuminates when in Sync mode. Applications: Suitable for use in Industrial work areas, Engineering Labs, Business Office, School Media Centers, and more where charge and sync operations are necessary. Utilizes 5V 2.4A per USB port for charging and synchronization. Incorporates 16 USB ports, each with option of charging or syncing via switch. Includes Charg Sync LED mode indicators. Heavy duty aluminum case design for heat distribution.